day a secluded cove where lounging and free your mind of all thoughts. The style of the villa is simple, the service is familiar and attentive: the restaurant of La Casitta is unique and exclusive, high-class, frequented by attentive and selected guests. La Casitta is ideal for dynamic couples, easy going, who appreciate the beauty of one of the last really unspoilt places in the world! La Casitta is located on an unique spot of the Sardinian territory – in the National Park of the Archipelago of La Maddalena – between the small islands of Budelli and Razzoli – right on Santa Maria island. The island of Santa Maria is easily reachable in 20 minutes cruise by motorboat from the port of Palau, which remain at an easy drive from Costa Smeralda Airport. For those who want to begin this dream in the proper way, CharmingSardinia com suggest a private transfer by Helicopter from the Olbia Airport of Costa Smeralda directly to the Santa Maria island, flying over the most beautiful sea of the world. You can reach Santa Maria Island by Motor Yacht from the port of Palau at the cost of €200,00 per way. Only for Charming customers: with a minimum stay of 3 nights in April, May, June, September and October, and a minimum stay of 5 nights in July and August, complimentary transfers from and to the Airport of Olbia are included in the price. La Casitta was an old shepherd house built in 1920. Lately it has been completely renovated, becoming an exclusive piece of heaven. Now, this unique piece of beauty, immersed in over five hectares of Mediterranean land and overlooking the clear blue turquoise sea, is a paradise for guests who search peace and tranquillity and love the fragrance of pure nature! 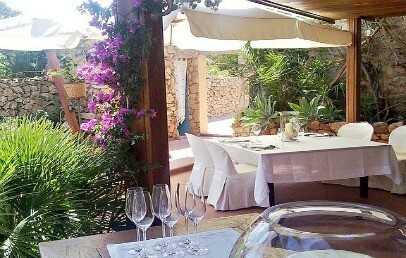 Even though La Casitta is not a proper Hotel, CharmingSardinia.com has classified it with 5 stars due to the beauty and charm of its location and the unique holiday experience that this place can give. Its main activity is the restaurant, for which it is famous thanks to the high quality of its service and that remains his focus and his pride. At the same time, the owners of La Casitta wanted to prepare five comfortable rooms divided into two villas, to allow guests to stay longer and explore this wonderful island. The two mansions are decorated and furnished with beautiful crafts and materials of typical Sardinian tradition and offer five double rooms in total, all with en-suite bathrooms, a bright lounge area with large windows and, moreover, a big terrace with breathtaking view on the sea. 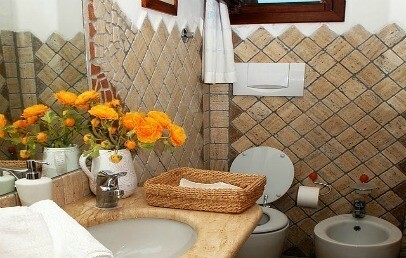 The Small Villa in exclusive use is composed by 2 rooms with private bathroom, for a total of 4 sleeping accommodations. It includes a kitchenand a courtyard with chars and tables. The Main Villa has 3 double rooms, 2 of which are Classic Rooms (private bath, spacious living room) and 1 Room with fireplace (fireplace, private bathroom, spacious living room). 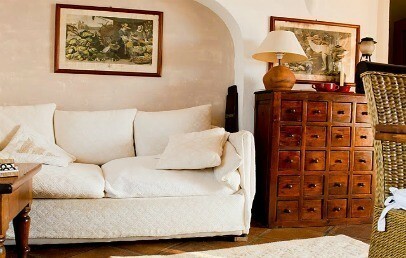 The living formula of “La Casitta” allows the guests to enjoy a top quality self-catering service. At guests disposal for any needs are also a chef de cuisine, a housemaid, a caretaker and an able fisherman/seaman. The restaurant of La Casitta meets successfully the requirements of a very demanding clientele, who chose it for the offered quality of products and its unique location. The base elements of the cuisine, prepared by the chef, are prevalently tasty fresh fish, lobster, suckling pig (Sardinian speciality) and vegetables from the kitchen-garden. Lunch and dinner plates are accompanied with good Sardinian wine and followed by delicious home made dessert and liqueurs. Drinks are not included. Two boats are at the guests disposal and can be used for fishing, diving and for reaching other famous and magnificent beaches close to “La Casitta” as for example “the pink beach” or “Cala Lunga”. Moreover this little nice island Santa Maria offers also fascinating walking paths on its surface of 3sq km. To complete your dream holiday in Sardinia, CharmingSardinia.com suggest to combine the stay at La Casitta with an exclusive cruise in Sardinia on board of a Yacht discovering the hiddn beauty of La Maddalena and south of Corsica. The small private villa lies 100m away from the sea. The furnishing is held in elegant, typical Mediterranean style, with attention to detail; a welcoming and bright building. It consists of 2 double bed rooms – each with a private bath room – and accommodates a total of 4. There is a spacious living room with a sofa bed and a kitchen. The Villa faces a terrace with sea view; there is a patio on the ground floor. The terrace and the patio both possess chairs and a table, sun loungers and umbrellas. 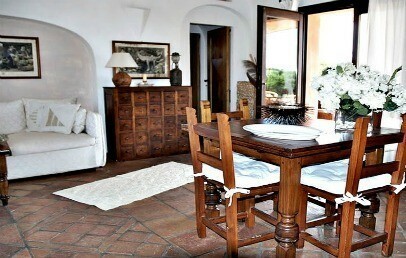 The double room with private bath is situated at the main villa, about 100m away from the sea. 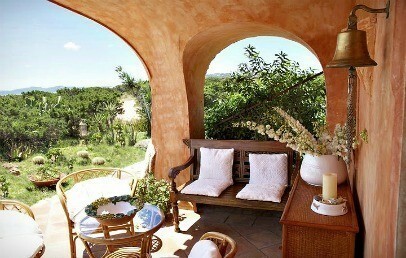 The furnishing is held in elegant, typical Mediterranean style, with attention to detail; welcoming and bright. Shared with the other guests of the Villa are a spacious living room and an equally spacious terrace with sea view, with chairs, tables and sun loungers.